I think I’m getting the hang of this now. The image I’ve chosen for this week is from 1971: ‘View of Dinah Shore and Burt Bacharach playing tennis - Fort Lauderdale, Florida'. Wimbledon Fortnight has just started today in England so this seemed an appropriate time to post this picture, which comes from the State Library and Archives of Florida, via the generosity of flickr commons. 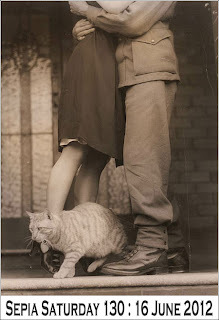 The photographer was Roy Erickson, a professional photographer in the Fort Lauderdale area at that time. I hope this gives the themers amongst us enough to choose from. If you don’t like the tennis connection (or any sport), how about ‘celebrities’ or even Florida? Of course, you can just choose any image or images as long as they are ‘historical’ as Alan says in the little box on the right. When you’re ready to join in don’t forget to add your name to Mr Linky below and paste in the URL of your Sepia Saturday post (not your blog) so that we know where to find you when we come calling. 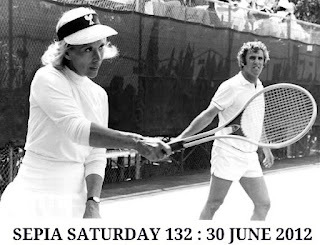 Then, after linking, leave a comment please.Try to visit as many other SS participants as you can during the following week (if you can tear yourself away from Wimbledon coverage) as we all like encouragement. We’ve acquired some new members recently (Alan will be pleased) so a warm welcome and please read the manifesto if you haven’t already. We’ve also had some returners so welcome back; you were missed. 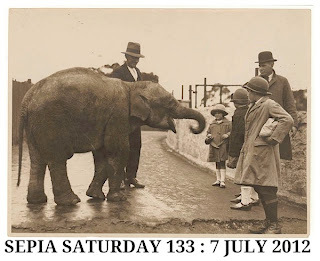 For the benefit of new members can I put in a plug for our Sepia Saturday Facebook page? Alan puts the weekly call on there and it’s also a great place to share some smaller sepia moments. 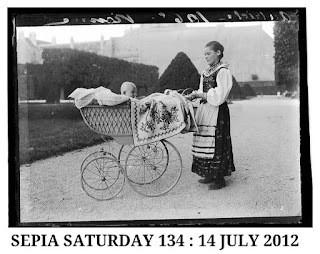 It’s a kind of Sepia Saturday overspill, and we have members on there who don’t participate on this meme, so you could be missing out on some fun. Do join us. Here’s a mini-banner for you to add to your post when you link back to Sepia Saturday. Spread the word. Now, please look away if you’d rather have a surprise over the next couple of weeks. If you want to know what I’ve chosen for SS 133 and SS 134, here they are reproduced below, so that you can start rummaging in your archives. 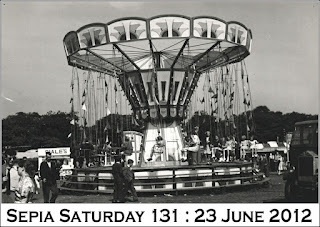 Here’s a mini-banner for you to add to your post and links your readers back to Sepia Saturday. Enjoy your ride everybody! For those who like to have advance warning of the next two prompts they are reproduced below. With knees knocking and sweaty palms I’m taking on the stewardship of Alan’s precious meme whilst he is away. I am of course both honoured and nervous. When Alan first mooted the suggestion on his recent visit to Lanzarote, I admit I tried to wriggle out of it. I thought he’d forgotten all about it, but he hadn’t. So there you are folks, you’re stuck with me and my choices for a few weeks and I do hope you enjoy the prompts I’ve selected for your delight. I’m sure we’ll have fun together. This week’s choice (made by Alan) is from The State Library of New South Wales and features a couple embracing whilst a feline friend snakes between their legs. At first I thought they were dancing, then realised that the man was in uniform and they were either saying ‘goodbye’ or ‘hello’. 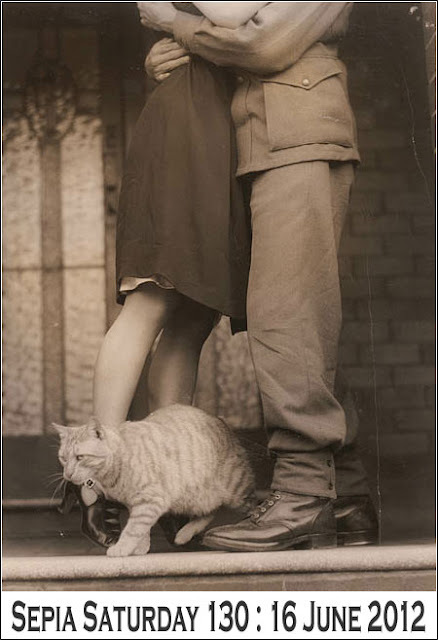 So, for the themers amongst us there are lots of ideas; doorsteps, fond farewells, or arrivals, cats (or any other animal), who ‘play gooseberry’, legs separated from their owners, men in uniform. 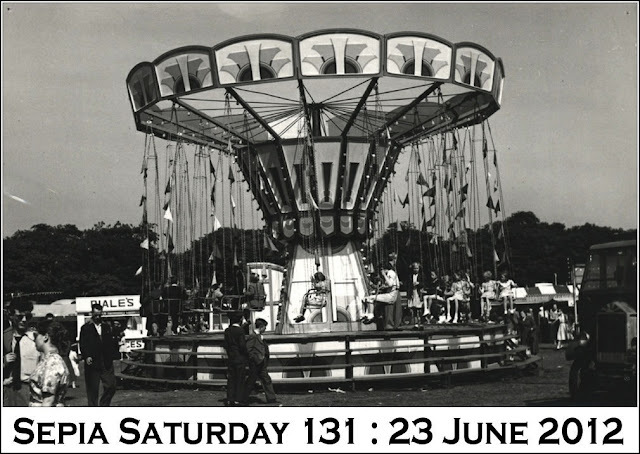 If you don’t fancy following a theme just give us something old inspired by the prompt, post it on, or around Saturday 16th June and don’t forget to add your name to Mr Linky below. If you have a moment to spare during the week pop back here to see what other contributors have come up with and give them some encouragement. You’re bound to be entertained by the sheer variety and creativity. Now, for those who have elected to get advanced warning of coming posts here are the next two. I take full responsibility for these choices, so I hope they pass muster. Now that is what I need - a nice cup of tea. Things have been rather hectic of late and I have been a somewhat intermittent and rather unreliable sepia poster. For this, I offer my sincere apologies. I would like to say that, from now on, things will get better - but they won't as I am about to go on holiday. But fear not, my Sepia friends, I have arranged for Sepia Saturday to be looked after in my absence by someone you will all be very familiar with - Little Nell (Marilyn Brindley). She has kindly agreed to look after things until I return in time for SS134 on the 14th July and from next week onward she will be choosing the theme archive images and looking after the Sepia Saturday Blog. I can't think of a more creative pair of hands to look after things whilst I circumnavigate the Mediterranean. Whilst she posts the weekly call, I will be sitting in my cabin being served tea from a silver teapot rather like the lady in this week's prompt image (and yes, you have guessed it, I have gone and forgotten where I got the image from again - I need a holiday). 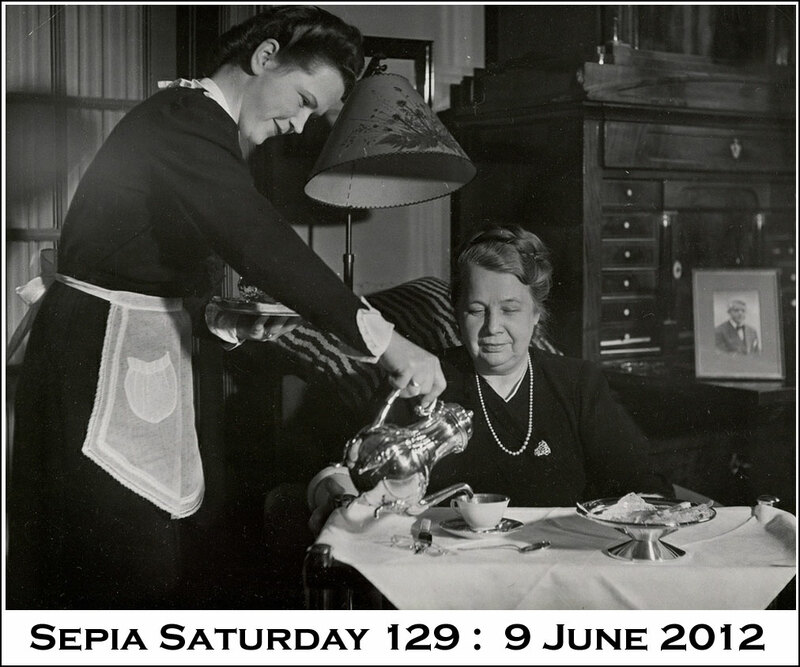 Whilst sipping tea served from a silver teapot may be a somewhat creative interpretation of my holiday, you are free, of course, to be as creative as you like in interpreting the theme for Sepia Saturday 129 (posting your posts on or around Saturday 9th June 2012). And as usual, you can ignore the theme all together and post whatever old image takes your fancy. Just post your posts and then add a link to the Linky List below. 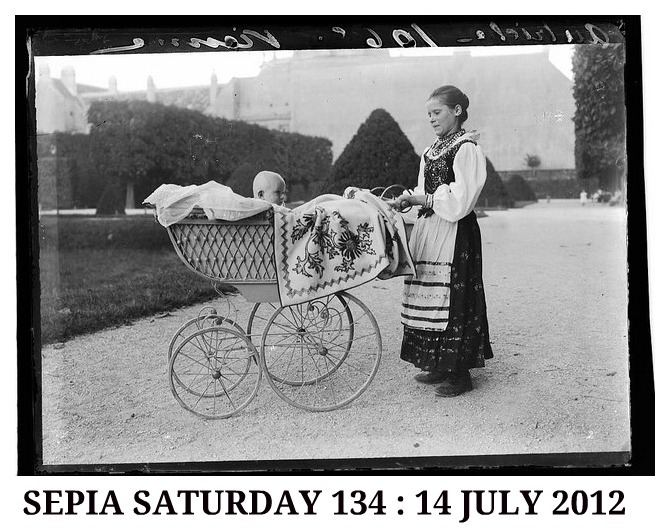 For those wanting a sneak preview of the next two Sepia Saturdays, here it comes.